This drawing illustrates workmen dismantling the tower of St Michael's Church in the City of London. St Michael's lay close to the site of "New London Bridge", which was soon to be completed in 1831. The bridge was designed and built by John Rennie and replaced an older structure that had spanned the River Thames for six centuries. St Michael's was demolished because of this new development; its parishioners joined those of St Magnus the Martyr on Lower Thames Street. The last church service at St Michael's took place on March 20th 1831. 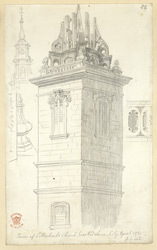 The drawing of the tower was created in the following month, when demolition commenced.